Sheppard Strudwick had dignified dark good looks but was never able to fill the role of leading man. 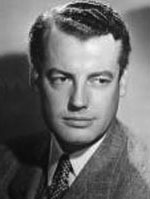 Shepperd Strudwick (September 22, 1907 – January 15, 1983) was an American actor of film, television and stage. Perhaps his most famous film role was that of Adam Stanton, the idealistic doctor who finally kills Willie Stark n the classic film All the King's Men (1949). Another notable role was Father Jean Massieu in Joan of Arc (1948), starring Ingrid Bergman as Joan. Strudwick made many appearances on television, including the role of Dr. Charles Morris in the 1958 Perry Mason episode, "The Case of the Fugitive Nurse." He also appeared on The Twilight Zone, (in the episode "Nightmare as a Child") and several roles on the soap operas As the World Turns (Dr. Fields), Another World (Jim Matthews), One Life to Live (Victor Lord) and Love of Life (Timothy McCauley). In 1981, he starred as the voice of Homer in the National Radio Theater's Peabody Award-winning radio dramatization of the Odyssey. His last appearance on film was in 1981's Kent State, a TV film. That same year, he was nominated for the Tony Award for Best Actor (Featured Role – Play) for the Broadway play To Grandmother's House We Go.